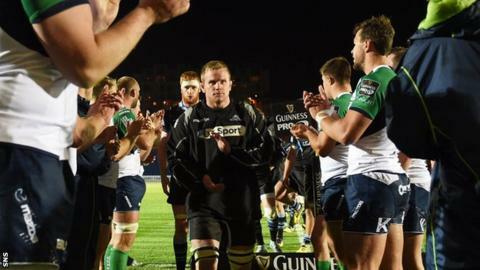 Glasgow Warriors produced some of their best rugby in recent years to beat Connacht, according to head coach Gregor Townsend. The hosts raced into a 23-6 lead at Scotstoun before seeing off a spirited comeback to secure a 33-32 victory. "Some of the rugby we played in the first half was the best we've seen over the last four years," said Townsend. "The second half of last week [against Scarlets] and the first half this week would be a good combination." Tries by Glenn Bryce and Scott Cummings helped Glasgow build up a healthy advantage at the break. Rob Harley crossed for the hosts early in the second half but John Cooney then touched down for Connacht. A penalty try and scores by Danie Poolman and Nepia Fox-Matamua gave Glasgow more concern but they held on for their first Pro12 win of the season. "Connacht came back into the game and we never saw much of the ball in the second half," added Townsend. "I still felt that when we had the ball, there's maybe two or three sequences in the second half, where we looked dangerous and we got the points that won us the game."